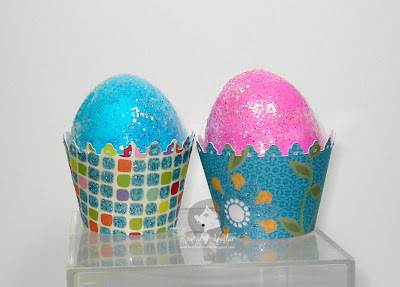 My Creative Time: My Easter Workshop! I hope everybody had a WONDERFUL weekend! I just wish I had one more day off:) Here are the rest of the projects we made on Saturday! If you haven't seen the 2 scrapbook pages we made, you can see them HERE & HERE! This was cute topper we made using that cute little lamb from the Easter 2010 cart, isn't he just too adorable!!?! I tried to use the Easter 2010 cart for all the projects that we made, but that didn't happen! I know I already showed you this card in a previously post, but I wanted to show you how one of the girls had decorated her w/the white gel pen! I thought she did an awesome job so I made another one & copied her:) I think it looks way better than the 1st one did! Last but not least, these are the YUMMY easter cupcakes that my mom made for us! Aren't they soooo cute?!! Thanks for visiting & have a great night! Emma it sure looks like you had a lot of fun. I love the egg holders they are so cute. What a cute Easter treat bag! I wanted to make those for my sons class but we'll be out of town. Everything looks so Yummie! !Great idea for holding those eggs. How much fun is that !! And I love that little lamb, so cute!! love the lamb candy tag! and the cupcakes look so yommy! How fun! Everything looks awesome! Thanks for sharing your cute projects. SUPER CUTE! That's it, after i get my van out of the shop later i'm going to Michaels to get this cart! I hope they have it! btw...all solutions carts are on sale for 14.99! You are SO talented Emma!! LOVE your mini egg treats and the egg holders. Looking at your Mum's cupcakes, I can see where you get all your creativity from!